Welcome to the instrumental band program at Notre Dame Schools. At this time of year, a new group of students eagerly awaits their turn to join the instrumental music program. The study of music could be one of the most valuable steps in your child's education. Some of the benefits your child can receive from it are responsibility, mental discipline, teamwork, self-esteem, and above all an enjoyment and lifelong appreciation of music. They will also be participating with a positive peer group that can influence their success in other academic and social areas. My experience as a music teacher has convinced me that any child willing to put in a reasonable amount of effort can succeed. All lessons are tuition-free to Notre Dame students. All that is necessary for you to do is obtain the instrument best suited to your child and purchase the recommended lesson book. WHICH INSTRUMENT TO TAKE? 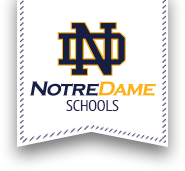 If your child attended Notre Dame Elementary School last year, he or she has seen a demonstration of various band instruments played by the Notre Dame Jr.-Sr. High School students this past spring. Your child was evaluated by trying out three of these instruments. A letter was mailed to parents with an instrument recommendation based on this assessment, student desire, and balanced band instrumentation. If your child has expressed a special interest in learning to play one of these instruments, then there is a high probability that he or she will succeed in learning to play that instrument. Some parents may question that their child is talented enough to study music. While some students may initially achieve early success, all students can learn to play an instrument with practice. Some students mistakenly believe that they cannot participate in sports if they are in band or orchestra. This is not true. Many of our varsity athletes are members of the high school music program. You are, however, free to purchase or rent an instrument wherever you wish. I will be happy to advise you on reputable instrument brands and examine any instrument to determine if it is in proper condition for your child to begin lessons. A quality instrument is of critical importance, so please contact me for a recommendation if you choose to acquire an instrument from a source other than a musical instrument dealer. There is a limited number of school owned instruments available for lease. Regardless of whether you decide to buy or rent, all participating students must have their instruments by the week of September 28 in order to insure that they get off to a successful start with their beginners group. Many people wonder if the time required in music will hinder other studies. Not according to the National Association of Elementary School Principals! They report that children who excel in music often excel in academic areas, because the self-discipline they acquire in music helps in other areas. Their study shows that music can enhance reading, writing, math, history, art, eye-hand coordination, memory, and the ability to follow directions. I hope you agree with my belief that every child should have the chance to learn and participate in music, to understand it, and to appreciate it. I look forward to seeing you at the meeting!